Scorpions have eight legs, a pair of pincers (pedipalps) and a narrow segmented tail that often curves over their back, on the end of which is a venomous stinger. The scorpion uses their pincers to quickly grab prey and then whip their poisonous tail stinger over to kill or paralyze the prey. The tail is also used as a useful defence against predators. Scorpion species range in size from 0.09 cm to 20 cm. Scorpions can be found on all continents except for Antarctica. There are over 1750 known species of scorpion. 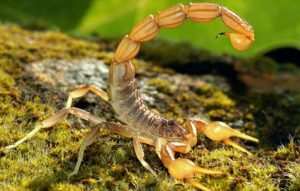 While humans generally fear the scorpion and its poisonous sting only about 25 of the species have venom capable of killing a human. Under UV light such as a black light scorpions are known to glow due to the presence of fluorescent chemicals in their exoskeleton. The scorpion is nocturnal, often hiding during the day under rocks and in holes in the ground before emerging at night to feed. Scorpions can eat a massive amount of food in one meal. Their large food storage organs, together with a low metabolism rate and an inactive lifestyle means that if necessary they can survive 6-12 months without eating again. Areas of China have a traditional dish of fried scorpion, and scorpion wine features in Chinese medicine. The scorpion is one of the 12 signs of the Zodiac, with the Scorpio constellation identified in the stars. Scorpions moult, they shed their exoskeleton up to 7 times as they grow to full size. They become vulnerable to predators each time until their new protective exoskeleton hardens.